When I first heard the phrase “fossorial mammals” and how important they were to grassland ecology, I thought of giant ground sloths (Megatherium) and saber-tooth tigers (Smilodon). Sadly, I was wrong. “Fossorial” just means “ground-dwelling,” like “arboreal” means “tree-dwelling.” Although the days of giant sloths and pygmy mammoths have passed, our grasslands are ruled still by fossorial mammals: pocket gophers (Thomomys). 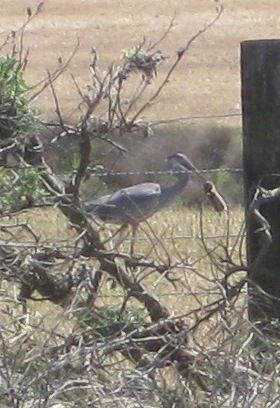 Great blue heron eating a gopher. Herons usually dip the gophers in water (either to drown them or make them go down easier). Photo courtesy of National Park Service/Andrea Williams. If you have a lawn, you probably know how much earth a gopher moves in a very short time. They’re major engineers in grassland ecosystems, putting up impressive numbers: estimates have 1-3 mounds per day, 70 mounds per month, as much as 2.25 tons of earth moved in a year (or an average of just under 50 tons for a population of 50 gophers). In many grasslands, there are 20-30 gophers in a single acre turning over a quarter of the soil. While this may seem like a nuisance in your yard, it’s enormously important to many wildflowers and plants that need the bare mineral earth to establish; and the burrows are used by dozens of other animals. Plus have you ever seen a coyote, bobcat or great blue heron eating a gopher? Very cool. We generally consider ourselves lucky to still see grassland mammals—the aforementioned coyote and bobcat, plus badgers and meadow mice and ground squirrels—but not the poor unappreciated gopher or mole. Moles, they can smell in stereo, and know which nostril is picking up a particular scent. And although they may make your yard lumpy and eat your favorite plants, gophers (and to a smaller extent, moles) are foundations of a healthy grassland ecosystem, creating space for numerous other plants and animals to live.